It has been observed that most developed economies of the world achieved the feat by anchoring their transformational efforts on agricultural development, thus profiting maximally from the gains of the virile sector and attaining food security. In the same vein, the inability of Nigeria to catch-up with the developed nations was adduced to the nation’s failure to benefit from its vast agricultural resources. Erudite economist and Deputy Governor (Operations), Central Bank of Nigeria (CBN), Mr Babatunde Lemo, faulted the approach deployed by past governments in Nigeria and said despite the efforts by successive administrations in the country to jump-start the economy using agriculture as the lynch-pin, not much had been recorded, thus leaving the nation in dire-straits and in a fragile situation as measurable by all development indices. Mr. Lemo spoke while delivering a lecture as Guest Speaker at the 3rd Night of Excellence and Productivity Awards of the Federal University of Agriculture, Abeokuta, an occasion which coincided with the 24th Anniversary of the institution, which was established on January 1, 1988 following a pronouncement by the then President, retired General Ibrahim Babangida. Delivering the Lecture titled: Agriculture: An Effective Tool For Accelerated Economic Growth, Mr. Lemo contended that the pervading stunted growth in agriculture and food production in the country was occasioned by a faulty value chain-based approach to development, which he noted had been segmental rather than strategic, at reforming the agricultural sector. agro processing, industrial manufacturing and trade exports. According to him, the country had suffered many setbacks from its wavering and lip-service focus on agriculture, saying that the boom in petro-dollar earnings into the nation’s coffers had made Nigerians complacent about agriculture and its capacity for economic rejuvenation. He noted further that notwithstanding attempts aimed at mechanized agriculture, the performance of the sector had continued to decline in terms of growth, export revenue and contribution to Gross Domestic Product (GDP). Mr. Lemo also posited that the introduction of the controversial Structural Adjustment Programme (SAP), during the military era, led Nigerians to the consciousness that the neglect of agriculture had weakened the ability to absorb the oil price decline of the 1980s, thereby promoting diversification that gave agriculture an edge, eliminating issues of price control and commodity boards. However, the CBN Deputy Governor said SAP was not much of a success as it failed to address vital issues of coordination, public goods peculiarities and the information asymmetry of commodity pricing thereby subjecting farmers income to market vagaries and discouraging farming activities and businesses. He stated that the new strategy to transform the country’s economy should place agriculture in the front burner of opportunities for creating jobs as it had a multiplier effect on other sectors by fostering linkages with markets and industries. 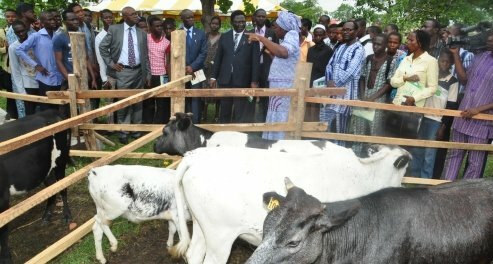 The Guest Lecturer also said the impact of a boost in agricultural productivity, profitability and food security, would help to fast-track growth in other sectors of the economy and would have far-reaching impact on enhanced education, improved healthcare system, adequate security, development of infrastructure and conducive business environment. Speaking earlier, Vice-Chancellor, FUNAAB, Professor Oluwafemi Olaiya Balogun disclosed that the award event symbolizes the celebration of courage, hardwork, diligence, initiative and industry among all segments of the University community. Professor Balogun opined that the reward for hardwork and dedication would not only help in sustaining, but could increase the tempo of productivity by both academic and non-teaching staff members.